This is without doubt my second-favorite aphid genus. Aphthargelia rumbleboredomia apterae and nymphs from North Idaho. There’s also a nymph of Capitophorus essigi in this photo. 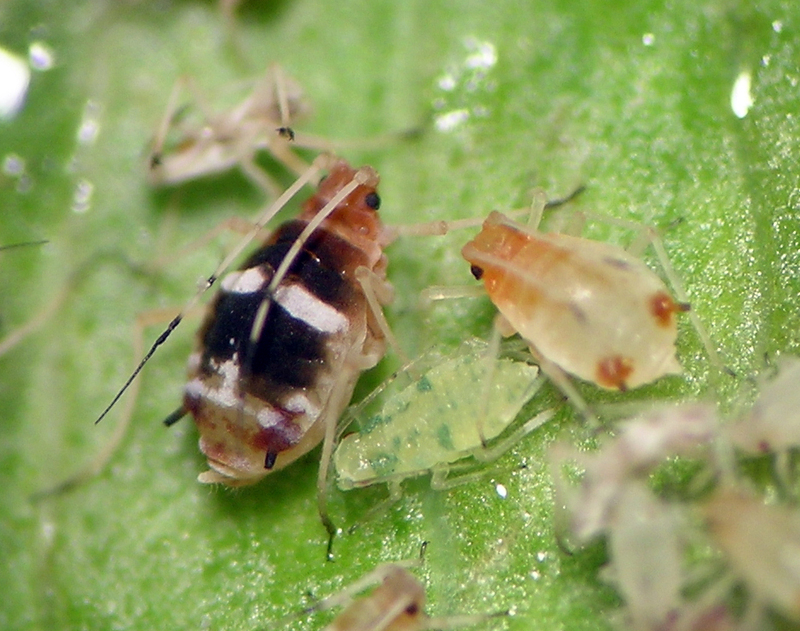 Several years ago I was collecting aphids on various plants along a road in the mountains in North Idaho when I found a fabulously colored aphid living on a giant Polygonum species I had never seen before (turns out to be Polygonum (or some say Aconogonon) phytolaccifolium). Jensen, A.S. 2013. 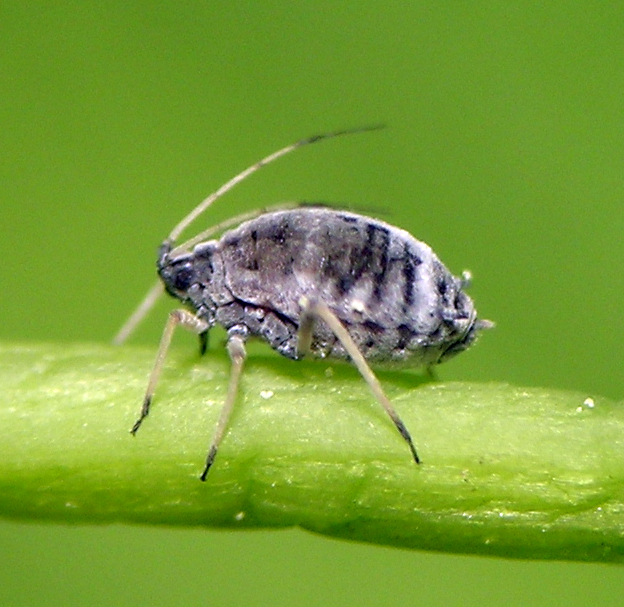 The Aphid (Hemiptera: Aphididae) Genus Aphthargelia Hottes, with One New Species. Zootaxa 3701 (3): 381-392. Poor Aphthargelia nymph! 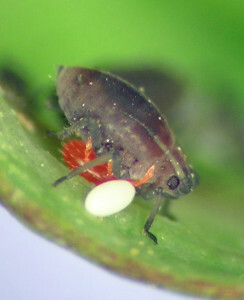 Beset by a blood-sucking red mite, and standing next to an egg of a flower fly about to hatch into an aphid-destroying maggot. For a couple years I thought the work might delimit a few new species of Aphthargelia, but in the end I concluded there are only two: A. symphoricarpi, highly variable, widespread, and monoecious on Symphoricarpos, and a new species, A. rumbleboredomia, the beautiful aphid that migrates from Symphoricarpos to Polygonum phytolaccifolium. However, then came the collecting season of 2017. As noted in my blog post summarizing the season, I found Aphthargelia on Polygonum bistortoides (bistort) and Rumex occidentalis in the mountains near our Lakeview home. So, research on this genus has begun anew. This spring I am gathering material from Symphoricarpos in our local woods, and have already conducted two successful host transfer experiments, one to a potted bistort in my office, and one to bistort in the Warner mountains. The crucial and possibly difficult thing now will be to decide whether this host-alternating form should be carved out of A. symphoricarpi as a new species, and if so how to recognize it among the diversity of ‘A. symphoricarpi‘ across the continent. Aphthargelia on Symphoricarpos albus (? ), Fremont National Forest, Oregon. An Aphthargelia species on a yellowing leaf of Polygonum bistortoides. Rumble the dog, also known as Mr. Bumble. Further, “This species was first discovered by the author living on Aconogonon phytolaccifolium. This plant is a large herbaceous perennial herb (stems up to 2 m long) in the mountains from Alaska to California, Montana, and Nevada (Hitchcock and Cronquist, 1978). It inhabits rocky meadows, talus slopes, and mountain ridges. In practice, it is often found growing along primitive roads, which seem to provide suitable habitat. Following the initial find of A. rumbleboredomia on roadside A. phytolaccifolium, it was found several other times in similar mountain habitats of northern Idaho. Searching in the late fall found no specimens on Aconogonon, and because Symphoricarpos was in the area, host alternation was suspected. 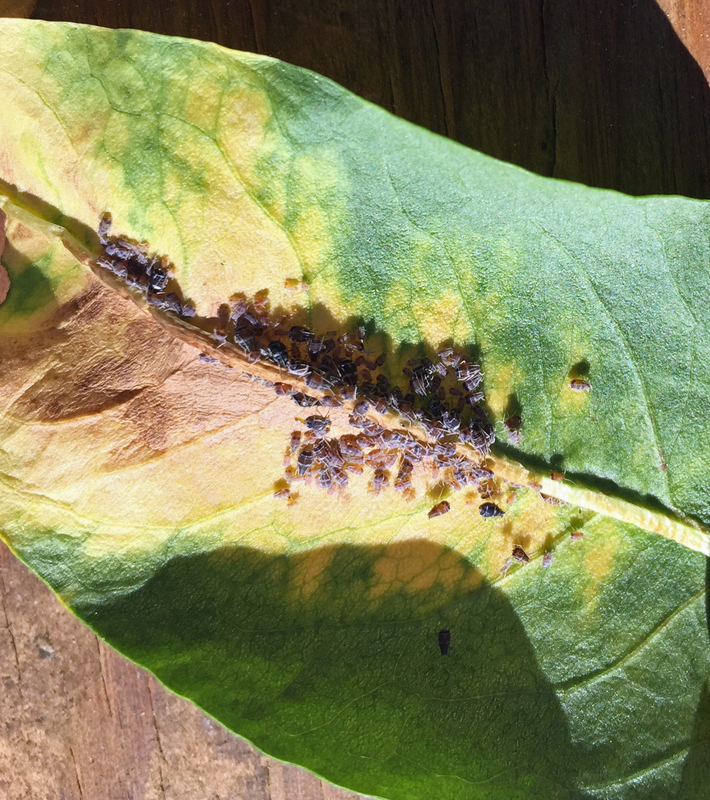 In July of 2011 several new colonies were found on lower leaves of A. phytolaccifolium near Crystal Lake, Idaho. The alate viviparae founders of these colonies were still present, several with signs of age, such as broken wings and accumulated dust. 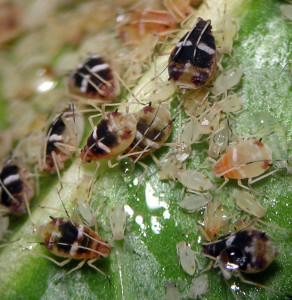 These features are indicative of aphid colonies started by migrant females. 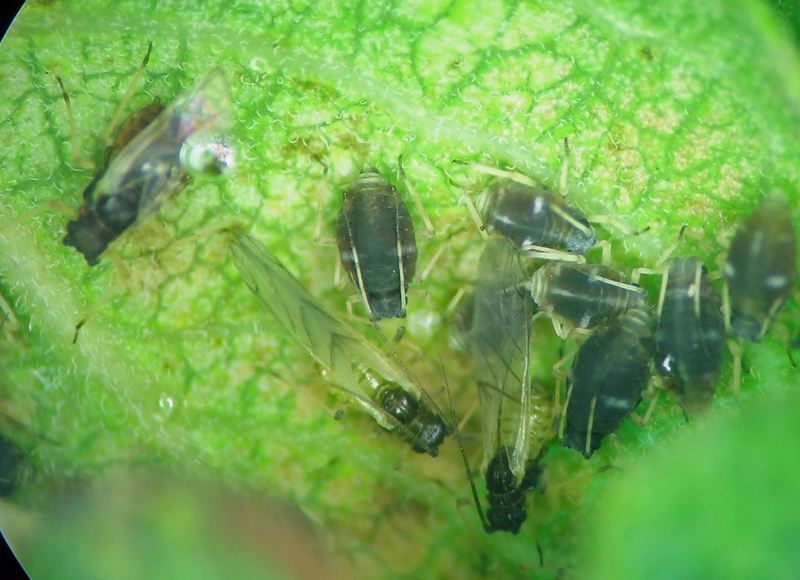 Finally, in September of 2012 migrant females were found colonizing Symphoricarpos and producing oviparae. Both locations where re-migrating alatae were found on Symphoricarpos are near known populations of Aconogonon. Aphthargelia rumbleboredomia from northern Idaho near St. Joe Baldy. Andersen (1991) studied this species on Aconogonon davisiae (as Polygonum newberryi) on Mount St. Helens starting four years after it erupted in 1980. His work looked at the interactions between A. rumbleboredomia and the ant Formica fusca, concluding that the aphid performed better in the absence of ants, and that the ants were primarily acting as predators. On Aconogonon, this species is often found on the lower to middle leaves, and in mixed assemblages with Capitophorus essigi Hille Ris Lambers. So far A. rumbleboredomia has been collected in Idaho, Oregon, and Washington, but likely occurs in other states and Canadian provinces where its hosts grow in reasonable proximity.” Since this paper came out I have added Colorado to the range of this species. 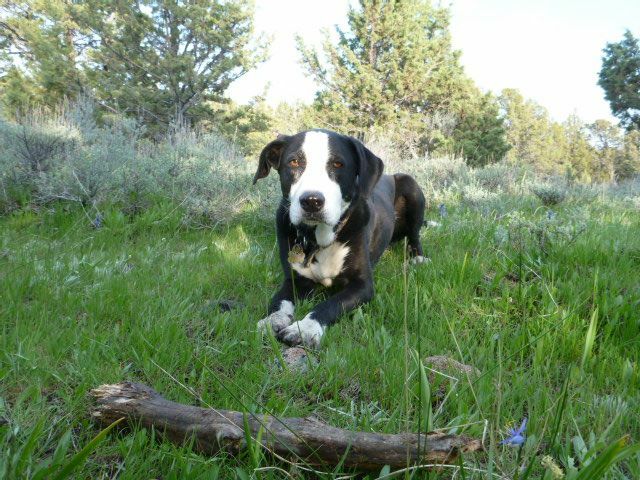 Since this paper came out, I have collected the spring apterous and alate viviparae on what appeared to be Symphoricarpos mollis in the Cascade Mountains of Oregon. I worry about my identifications of the species of Symphoricarpos — I’m trying develop the skill and knowledge to do it correctly, but each species seems to be quite variable and hard to pin down in the field. As noted in my 2013 paper on this genus, A. symphoricarpi is a complex taxon: “This species appears to be holocyclic and monoecious on several species of Symphoricarpos. Males appear in many of the summer collections studied for this work. Production of males throughout the life cycle occurs in other aphids, such as Nasonovia (Kakimia) cynbosbati (Oestlund). Another oddity of A. symphoricarpi is the extreme variation in size, the smallest specimens being well under half as long as the largest and more typical specimens. This also is not uncommon, with such extremely small specimens referred to as summer dwarfs. Another strange morph feature of this species is the late-season production of very small alate viviparae which develop in conjunction with males and oviparae in short-season montane habitats. One often finds this species tended by ants, and sometimes living together with the aphid Cedoaphis (see discussion of this genus above). 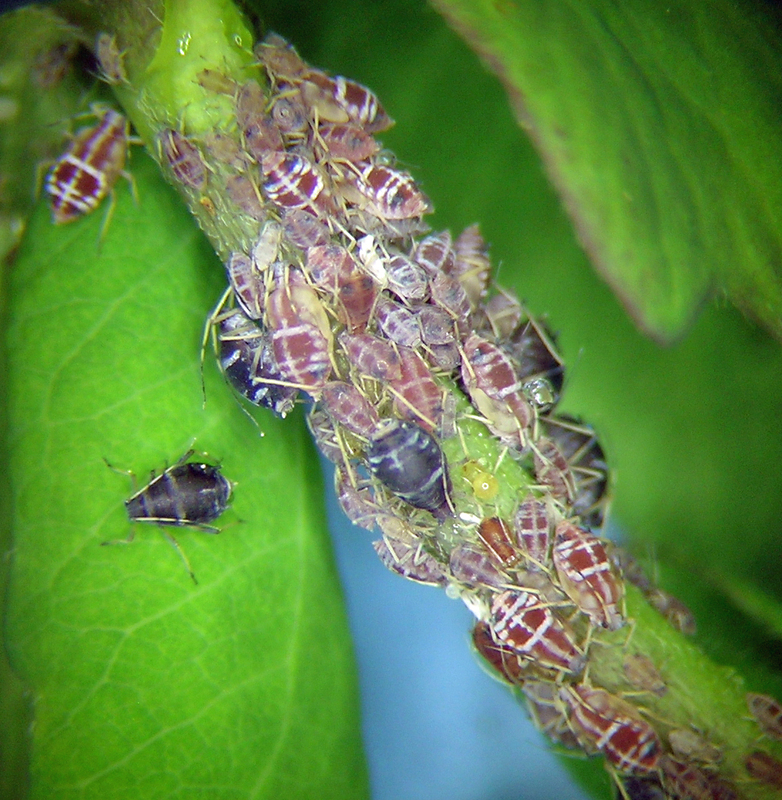 Infested stems often have curled leaves, with aphids feeding on the stem and undersides of leaves. Aphthargelia symphoricarpi is widespread in North America wherever Symphoricarpos occurs, including ornamental plantings.” However, see the discussion at the top of this page for some updates! The ovipara and two colors of small alate females of Aphthargelia symphoricarpi on snowberry in the Eagle Cap mts. of Oregon. 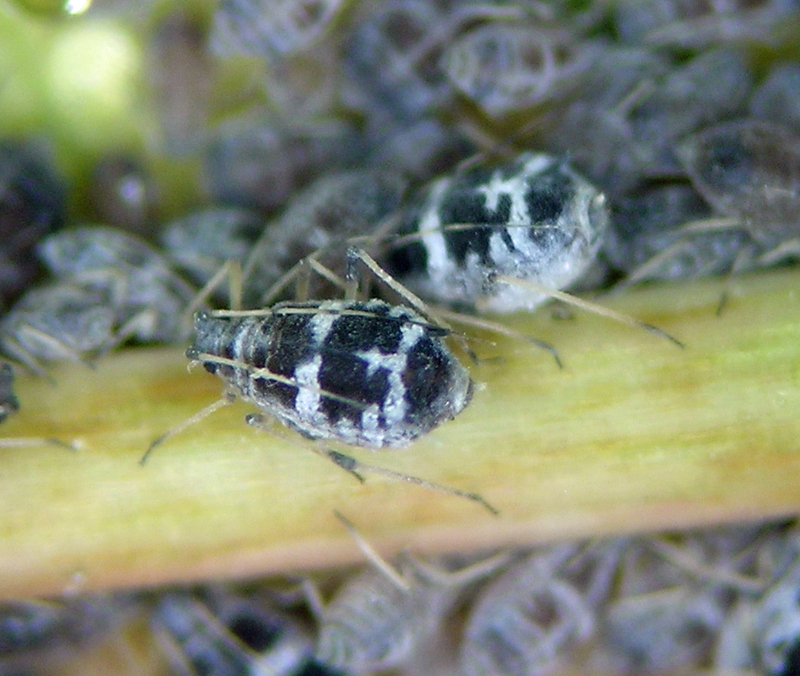 I originally thought the alates were males, but after mounting it turns out that they are very small and strangely colored viviparous females developing to adult at the same time as oviparous females and males.